I am a friend of RM and value his advice/knowledge! 220g Mostly Softie tank. 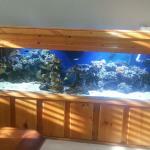 Vlamingi, Sailfin, Mimic, Regal Tangs, Mono Argentus.